There is a reason that Husband didn't own any shorts (or swim trunks) when I met him. Farmers need to wear jeans. In all temperatures. In all situations. This is not the pig that bit Ryan. In this picture all three kids are wearing shorts with the pigs, without incident. 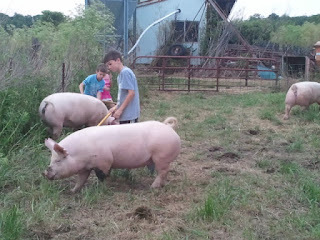 Unfortunately, the pigs were in a bad mood that day and got in a fight. Pigs are territorial. They usually get along with other pigs, but like people, they tend to be wary of new pigs inside the gate and tend to fight, sometimes viciously, to establish the pecking order of the pen. We're not sure why the pigs were fighting but Ryan got caught in the middle. His bare pink leg got taken for pink pig flesh and he was bitten by his brother's pig for the county fair (now jokingly dubbed ManEater). Ryan started bleeding and then screaming and fortunately, Husband was nearby to rescue him. The long gash on his leg led to a trip to the emergency room for stitches. Ryan was the talk of the children's hospital ER, with various doctors and nurses out in the hallway asking if they could check out the kid with the pig bite. He was cleared for sports but due to pain and swelling decided to sit out his soccer practice that night. I can imagine the conversations that went on in several households in our community as Ryan's fellow soccer players tried to convince their mothers that, yes, their teammate really WAS bitten by a pig. After making a few jokes, including asking him if he needed oinkment, the team rallied around him and even brought a sweetly homemade card that said get well. I can understand the need for a homemade card, unless Hallmark has a new agricultural line. Ryan is recovering nicely and will keep his stitches until next week--smack in the middle of the county fair. We plan to ask the veterinarian to remove them (only half joking about this).